Many people in the United States and elsewhere confuse Cinco de Mayo with Mexican Independence Day. The following activity is one you can use in your classroom. It outlines key features of each of these days in Mexico. 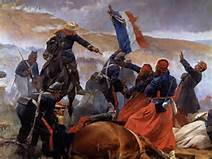 Cinco de Mayo commemorates the Mexican Army’s unlikely victory over the French at the Battle of Puebla, on May 5, 1862, under the leadership of General Ignacio Zaragoza. It is typically celebrated more in the US as a commercialized holiday. In Mexico, the people of Puebla may celebrate this date but rarely is it celebrated outside of Puebla (unless you are a resort in Cancun or other tourist areas). Mexican Independence Day came more than 50 years before on September 16, 1810. After more than 300 years of Spanish rule, Miguel Hidalgo y Costilla, a Catholic priest, launched the Mexican War of Independence with the issuing of his Grito de Dolores, or “Cry of Dolores. This Colorín Colorado page has links to excellent graphic organizers. Bookmark it for future lessons! We chose to use the features chart as the graphic organizer which is more beneficial to students than a Venn Diagram when it comes to comparing and contrasting two ideas. A features chart serves as a prewriting organizational tool as well! With the features listed, unlike with the Venn diagram, students can see natural areas for sentence and paragraph formation. 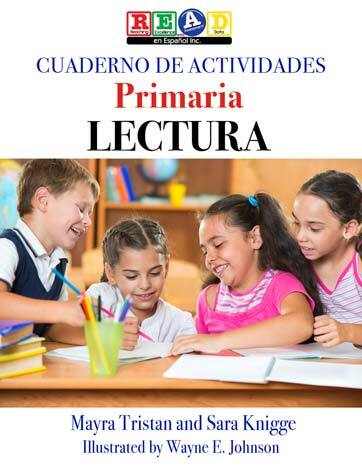 Teacher shows a blank features chart and discusses the “características” column with the students ensuring that all students are aware of their meanings. Group A has Cinco de Mayo cards and features/characteristic (fecha, razón de celebrar, personajes etc.). Link will allow you to make a copy and edit as desired. 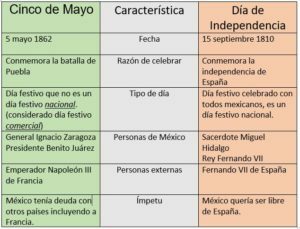 Group B has Día de Independencia cards and features/characteristic. Link will allow you to make a copy and edit as desired. Students discuss their word cards and match the feature with the correct phrase. Class comes together as a whole to create the following features chart. Here is a link to the image below. Here is a link to a blank more advanced features chart in Spanish. Link will allow you to make a copy and edit as desired. Extension: Students can write a paragraph, create google slides or interview a family member who has been to a “Grito de Dolores” event.